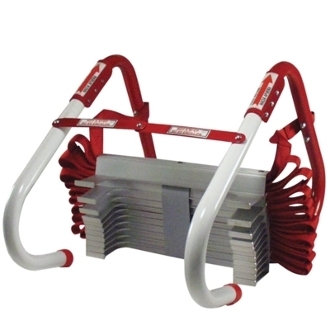 Portable emergency Escape Ladder stores easily for quick access in an emergency. Fits up to 9 1/2" -thick walls. No assembly required - just hang the brackets over the window sill, toss out the ladder, and climb down. Standoffs (6 5/8") keep the ladder away from walls, allowing for easy descent. Width 12 1/2". One-time use only.